At a fairly young age (around 5th or 6th grade), my mother started forcing me to get non-fiction books when I went to the library, being a former research biochemist and future high school teacher at that time. Naturally, considering those influences, I wandered into the science section of the library and started looking around. On one of these excursions I happened to pick up the book, "In search of Schrodinger's Cat," by John Gribbin. I was fascinated by his description of quantum mechanics, and resolved to learn more about it. This proclivity has stuck with me to this day, and I have been studying physics ever since. I started out just reading layman's books and scientific american articles and that sort of thing. I also attended lectures at Fermilab and the like. My junior year in high school, my mother suggested starting work on a science project for the Westinghouse Science Talent Search. I, of course, chose to do a physics project, despite my mother's assertion of her connections in biology and chemistry. With some help from a Fermilab physicist who was a member of my school board at the time, I got hooked up with Mr. Finley Markley of the Materials Development Laboratory of Fermilab. In his lab, I developed and didn't quite get working a scintillator detector which, in theory, would have been able to determine the position of incident radiation as well as its total energy. The idea was to attach light tubes to all four sides of a scintillator sheet, and make the assumption that the proportion of light received by a side was related to the angle that the point of incidence made with that side. After applying some trigonometry, you can figure out the position based on having the 4 angles. Neat idea. Never quite worked. Still got me into the top 300 of the WSTS, and placed me well at science fairs. The summer after my senior year, I worked at the MDL as a regular summer student. The work I did that summer involved testing the high voltage insulation of Kapton, that was to be used to insulate the coils of superconducting wire which would compose the SSC's magnets. This work was fairly simple - taking two pieces of coil wrapped in insulation, and applying pressure to them, and increasing the pressure until there was electrical breakdown. For further testing, I inserted different kinds of debris (i.e. dirt) in between the pieces to see how that affected the pressure needed to cause electrical breakdown. This work, while fairly simple, was of some importance, and after completing some additional research over IAP of my freshman year at MIT, I presented the results in a poster session at the Third International Industrial Symposium on the Super Collider in March of 1991 in Atlanta, Georgia. The associated paper was published in the proceedings of that conference. I still have a preliminary concept of the abstract from when Mr. Markley and I were working on it over e-mail. The following summer, I also spent at the MDL, working on/for the SSC again. I spent the summer making and testing scintillator slugs, composed of different materials, one of a team, trying to find scintillators whose performance would not degrade completely when subjected to high radiation. My work in this was acknowledged in a paper Mr. Markley wrote later for a conference. I decided to stay for IAP during my sophomore year at MIT, so of course I started looking for a UROP. I happened to be sitting in TEP's front room one day and turn over a piece of paper, which on its front had a description of a UROP that sounded exactly like what I wanted. A job working on the GEM detector collaboration for the SSC with MIT physicists. Even better, the contact person was my 8.03 recitation instructor, Prof. Louis Osborne. Unfortunately, it said the UROP was geared towards juniors with an eye towards expanding it into a thesis, but I figured I might as well give it a try. So the next recitation, I talked to Prof. Osborne, and asked him what I needed to do to apply. He gave me a little form where I described my previous work at Fermilab, and the classes I had taken, returned it to him, and waited. A couple weeks later, I was contacted by Osborne and told I'd gotten the UROP! Yay! That IAP, I ended up working for Prof. Lawrence Rosenson, trying to extract results from a simulation program called ISAJET. This was fairly unsuccessful, but was a good introduction to how complex physics programs can get. The next summer, I was planning on continuing work with Prof. Rosenson, but he was going to be out of town, and told me to start work with Prof. Osborne. My first project was to write a program to interface an IBM computer through a board to a CAMAC crate, and take measurements from a qVt analyzer, graph the resulting histogram, and save the data. Coincidentally, I had done almost exactly the same project at Fermilab as part of the testing setup for the scintillator slugs; hence, I was able to get it up and running at MIT in a couple days, and the data taken in about a week, which was FAR faster than Prof. Osborne had expected results, and got my relationship with him off to a good start. I continued with this project for a few more weeks, and gathered more data for inclusion in a GEM collaboration paper on the Limited Streamer Drift Tubes (LSDT's) that we were testing. This work was also acknowledged with a co-authorship on a paper on LSDT's submitted to Nuclear Instrumentations and Methods in the fall of 1993, which was later published after some editing. The rest of the summer was spent in a futile attempt to attempt to do the same thing with a Macintosh computer. My major constraint in this was that I was told to program in Fortran, and Macintoshes are centered around the Pascal language, so the interfacing was very difficult. This project was abandoned soon after the end of the summer. However, I did learn a great deal about the intricacies of Macintosh programming, and how to use the Macintosh toolbox. The following IAP and summer, I spent primarily working for Andrey Korytov, a researcher at MIT in Osborne's lab. Most of this work was centered around the possibility of developing different types of drift chambers: in particular, Andrey was considering a mesh drift chamber which would have alternating anode and cathode wires, which would be held in place by a non-conducting mesh of some sort. That IAP I spent mostly running simulations of the detector to be, using Garfield, a drift chamber simulation program written at CERN. The following summer, we started running test on single-wire chambers to determine their charge spectra and counting efficiencies at different high voltages, both for use in our chamber, and for further information for the SSC collaboration. The following fall was the fall of my senior year, and the time for me to start worrying about the T-word: thesis. My initial project was to continue developing the mesh chamber for possible use in the SSC collaboration in certain applications. However, this completely fell through when the SSC funding was slashed in October of that year. (It was kind of fun to be able to say my thesis got slashed by Congress, but only kind of). Luckily we were able to find another possible use for a modified version of that detector in the Stanford Large Detector at their linear accelerator. They needed a very thin detector (about half an inch wide) to do localization of tracks since their detectors were having multiple track problems, and were inable to correlate the hits from different chambers. Andrey suggested using an electrodeless drift chamber, which would also use the alternating anode/cathode wire setup. Simulating and testing this chamber eventually became my thesis. Unfortunately, SLD decided that they really did not need it, and just stopped using that section of their detector, but the work was interesting in and of itself, and, of course, allowed me to graduate from MIT with a B.S. in Physics. For the story on how I ended up at CERN after graduating, see my home page. I was involved in doing reconstruction of events in the muon detectors as a way of testing the resolution of the L3 detector. Essentially, we looked for a very specific type of event (e+e- -> mu+mu-) which left a signature trace of two muons leaving the detector back-to-back. In these cases, E/p should be 1, so we could measure that with our detectors, and the resolution of our detectors was correlated with the width of the Gaussian that we got when we plotted the histogram of actual measured E/p's. While at CERN, I also participated in the installation of forward-backward muon drift chamber detectors, played a little bit with the forward-backward muon reconstruction code, took shifts monitoring the muon part of the L3 detector, as well as various other odd jobs. I spent three years as a graduate student in the Stanford University physics department, taking various classes including all those old favorites like quantum mechanics, electrodynamics, statistical mechanics, plus some new twists like quantum field theory and the like. In addition, I worked on some C++ code for Pat Burchat, as part of the Babar collaboration. I also did some hardware work in the lab, including the programming of a Motorola MC6805 microcontroller for use on a printed circuit board to run the data acquisition from several ADC's. It was fun because I got to use a bunch of different pieces of equipment with wires strewn everywhere from the PC to the board to the emulator to the logic analyzer etc, as can be seen in the picture below (circa April 1997). I eventually decided to leave Stanford because I didn't see a future for myself in physics or academia, and thought that the work experience I could get instead (not to mention the salary) would be far more valuable. So I took a leave of absence from Stanford, having gotten my M.S. 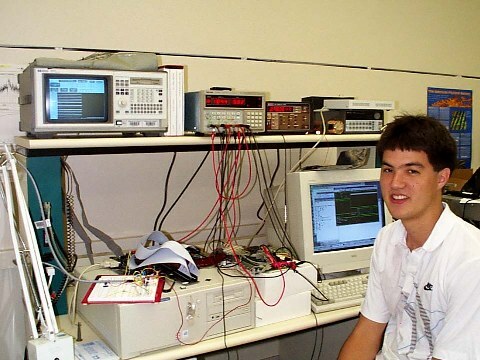 in Physics in June of 1998, to try my hand in the real world working with friends at SFIS. It was interesting to me how my experience in physics data acquisition was applicable in many different subject areas (from communications to biotechnology so far); in fact, most of the "high-end" data acquisition systems I saw were simple compared to the systems that I was involved with in physics. As is now obvious, I never went back to the world of physics. But I think that, with the background in problem solving and analysis that physics gave me, my physics background continues to help me in my working life. I always forget the exact references for the meager 2 papers I have, so I figured I'd stash 'em here so I'd be able to look them up without having to go to the library. Korytov, A., et al. "Performance of Limited Streamer Drift Tubes", Nuclear Instrumentations and Methods A: 338, p 375, Jan. 15, 1994. Nehrlich, E., Markley, F. and Rogers D. "The effect of particulate debris on the insulation integrity of SSC coils during molding and collaring", in Supercollider 3: Proceedings of the Third International Industrial Symposium on the Super Collider, ed. John Nonte, p. 389. Plenum Press, New York, 1991.